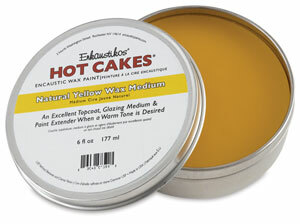 This medium can be used to extend paints or applied as a topcoat to impart an overall warm tone to your work. It is formulated using a 6 to 1 ratio of U.S. pharmaceutical grade natural yellow beeswax to damar resin, providing the same quality as Enkaustikos original Wax Medium with a warm yellow tone. The natural yellow properties come from pollen and may vary slightly from one batch to another.